"We give him a week to decide if we can call him one of us." Much like The Howling, which unfairly lurked in the lyncanthropic shadows of An American Werewolf In London for much of early 1980s, Kathryn Bigelow's modern day neo-western vampire flick, Near Dark, was surreptitiously buried behind more glossy and marketable vampires in 1987. Joel Schumacher's The Lost Boys, a fine (admittedly downright goofy) film in its own right, certainly did have the help of a vastly more aggressive studio marketing campaign, and its MTV-friendly pop culture vampirism was apparently a more surefire sell to mainstream movie audiences than was Bigelow's darker, more violent, indie tale. 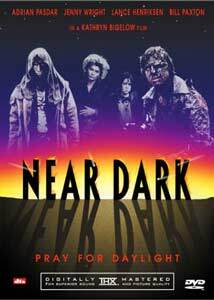 Near Dark, which has languished for far too many years NOT on DVD, has finally seen the light of day, thanks to this wonderfully packaged 2-disc set from Anchor Bay. It's safe to say it has been well worth the wait, indeed. Near Dark is an extremely minimalistic story at best: boy meets vampire girl, vampire girl bites boy, boy turns into vampire, boy struggles with fate; however, it should be made quite clear that the "v" word (vampire, that is) is never uttered once during this film, nor do we ever see a mouthful of razor-sharp fangs. Bigelow keeps the pacing unconventionally slow and deliberate, with a fine ensemble group of actors, including Lance Henriksen, Jenny Wright, Jenette Goldstein, Adrian Pasdar and a psycho tour-de-force performance by Bill Paxton, steering the action. Henriksen, Paxton and Goldstein had all appeared together in James Cameron's Aliens, and their apparent rapport works effectively for them as part of the vampire clan. Even the ever present gaps in common sense and logic that are apparent in the script seem comparatively minor (what horror film DOESN'T have logic problems?) when delivered by a such a solid cast. Watching the lazy, drawn out opening sequence as Pasdar's innocent cowpoke, Caleb, meets girl-next-door vampire cutie Mae (Wright) almost seems as if it is unfolding in slow-motion, especially when compared to the typical noisy, frenetic set pieces that open most films these days. Bigelow tends to keep the pacing moving in this laid-back manner, only to erupt sporadically in moments of great fury, and oddly enough, those sometimes meander on longer than one might expect. Even Near Dark's signature scene, the infamous roadhouse slaughter sequence, seems to percolate ever-so-gradually on its to way to the inevitable, explosive climax. Caleb is bitten during a moment of courteous front seat passion by Mae, and almost immediately against his will becomes a member of her dysfunctional family of bloodthirsty night-dwelling killers, made up of Jesse (Henriksen), Diamondback (Goldstein), Homer (Joshua Miller) and Severen (Paxton). With Mae's blood coursing through his veins, Caleb pretty much knows he has become slightly less than human because his flesh has developed the tendency to sizzle and smoke when hit by sunlight. As Caleb travels with the clan in their motor home with its blacked out windows, he has to work to earn their questionable trust, and at the same time come to terms with his new found taste for human blood. Near Dark oozes dusty, dark and hazy atmosphere out of every pore, and Bigelow's use of The Terminator cinematographer Adam Greenberg is undeniably one of the reasons why this is so. For a film with as many shadowy night scenes as this one, it really resonates and bristles with a kind of subdued energy, akin to having a low-voltage power line stuck under your fingernails. Time has not diminished the visual impact of Near Dark one iota; this film still holds up exceptionally well. Image Transfer Review: You'll really want to have all the drapes closed and any lamps turned off for this one, as a good 95% of the film takes place at night. The 1.85:1 anamorphic widescreen transfer is stunning, laden with deep, dark blacks that are rendered exceptionally well on this disc. Colors tend to be a bit muted, intentionally, because a film like this is all about night and shadow, and the transfer reflects that. Grain is minimal, and thankfully not terribly obtrusive. The restoration done here is quite good, with just a few small specks here and there. I honestly don't think Near Dark looked this good when it was released theatrically. Audio Transfer Review: There are three audio options for Near Dark, available in DTS, Dolby Digital 5.1 or 2.0 stereo. As is often the case these days, the DTS and 5.1 are very similar in presentation, and both provide crisp, balanced dialogue and a very noticeable bottom end kick. Neither offer much in the way of rear channel activity, which is my only real issue with the two tracks. The few times the rears come to life is subtle, but extremely effective, and I only wish the mix had been slightly more aggressive. Purists can opt for the film's original 2.0 stereo mix, if you feel like reliving 1987 again. Extras Review: Even if the extras totally tanked (and they don't), Anchor Bay earns high marks alone for this wonderfully packaged 2-disc set. The discs are housed in a tri-fold amaray case, that nestles in a decorative slipcase. The tri-fold case is very nice, and each of the six panels (front and back) features a closeup of each vampire, with one of their signature quotes. Inside, there is a 14-page booklet that features poster art and production tidbits, including 12 Things You May Have Missed & Other Interesting Facts About Near Dark. Overall, this is just an absolutely beautiful looking presentation. As for the extras themselves, they are almost all contained on disc two, with the obvious exception of the scene specific commentary from director Kathryn Bigelow, which is found on disc 1 (along with the THX audio/video optimizer section). As a fan of this film, I was really (emphasis on "really") looking forward to the commentary, but Bigelow has a rather slow, almost hushed manner of speaking, that when combined with an almost monotone delivery, makes for a sometimes tough listen. It's quite clear from her comments that she is a serious filmmaker, and that Near Dark was not just a frivolous horror movie obligation, but rather a project she still holds very dear to her. In that regard, I enjoyed hearing what she had to say, it's just that her delivery was sometimes less than dynamic. Another minor downside is that there are quite a few silent gaps during the commentary, and Bigelow's statements tend to be on the dry side, though I found her kind, almost reverential words about cinematographer Adam Greenberg to be concise and heartfelt. In hindsight, I would have loved to have had her teamed up with Lance Henriksen and Bill Paxton on the commentary, who no doubt could have injected a bit of momentum. Living In Darkness (47m:14s) is the centerpiece of disc 2, and it is an excellent new documentary about the making of Near Dark. Aside from Bigelow, there are insightful comments from cinematographer Adam Greenberg, producers Ed Feldman and Steven-Charles Jaffe, along with cast members Lance Henriksen, Bill Paxton, Adrian Pasdar and Jenette Goldstein. Oddly absent (without explanation) is Joshua Miller and Jenny Wright, who is the source of a particularly touching plea from Pasdar, which kind of made me wonder just what has become of her. All parties involved interject with some type of unique perspective, with the wacky stories from Paxton and Henriksen being the most memorable, after Pasdar's impassioned call for Wright. We learn such neat tidbits like the smoke for the vamps slowly burning flesh was a result of a contraption full of lit cigars connected to thin tubes that were affixed underneath latex skin. A jovial Henriksen provides an incredibly detailed story about how he interpreted his character of Jesse was turned. Living In Darkness, I expect, should truly please any fan of this film. The Stills Galleries is divided into the self-explanatory categories of Poster & Stills (over 90 pictures) and Behind-the-Scenes (29 pictures). The DVD-ROM extras include a complete script in PDF format, as well as an assortment of trippy Near Dark screensavers. The film itself is cut into a respectable 25 chapters, and oddly enough, there are no subtitles. Nice job, Anchor Bay. Nice job, indeed. Anchor Bay has come through once again with an impressively packaged THX-remastered 2-disc set for this understated modern day western vampire romp. Bigelow's Near Dark has actually aged much better than most genre films, and the presence of Bill Paxton and Lance Henriksen as vampires is just a damn beautiful thing.